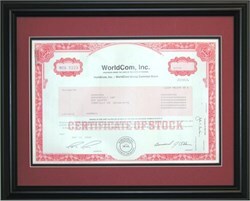 Beautifully engraved stock certificate from the WorldCom, Inc. - MCI Group. This historic document was printed by the Security-Columbian U.S. Banknote Company and has an ornate border with a vignette of the company name. The stock has the printed signatures of the company's president, Bernard J. Ebbers, and secretary, Scott D. Sullilvan. The certificate was issued to Scripophily.com prior to the company filing for bankruptcy and getting delisted. Our sales price includes the historic World Com certificate, frame with double matting, labor, packaging and USPS priority shipping within the continental U.S."
July 21, 2002 - WorldCom, Inc. filed for Chapter 11 bankruptcy protection according to the company's chief executive John Sidgmore. The bankruptcy is the latest in a spectacular series of corporate collapses. The filing took place in U.S. Bankruptcy Court in Manhattan and it ensures that the company receives about $2 billion in financing while it reorganizes. "Can we talk? ".......WorldCom admitted June 25 that it had falsely booked $3.85 billion in expenses to make it appear more profitable. The same day, the company fired chief financial officer Scott Sullivan who was later accused by company auditor Arthur Anderson of withholding crucial information about WorldCom's bookkeeping. WorldCom announced layoffs of 17,000 workers, or 20 percent of its global work force. The bankruptcy is twice as large as Enron's record-setting filing in December 2001. WorldCom reported more than $100 billion in assets at the end of March, but is burdened by $30 billion in debt. "Can we talk? ".........Even before the hidden expenses were exposed, WorldCom was struggling. Its stock traded as high as $64.50 in mid-1999, but shares have since dropped to 36 cents and even less. Shares of WorldCom and other telecommunications companies had slid ever since as the dot-com bubble burst and other market forces caused an industry-wide implosion. WorldCom's MCI Group is traded as a tracking stock. The MCI Group includes WorldCom's consumer and small business services including the long distance services. Inquiries into the company's accounting practices in 2002 led to the resignation of WorldCom's CEO and CFO and the filing of fraud charges by the SEC. The company plans to eliminate the tracking stock structure in July 2002. "Can we talk? ".......WorldCom currently employees more than 60,000 people in 65 countires, and serves over 20 million residential and business customers. It also operates the world's largest internet network. This historic certificate is framed, as illustrated, in a contemporary, black frame with red and black matting. The decorative wood frame is 1" wide with an overall size of 12 3/4" x 15 3/4". Archival mounting, acid free backing, and clear glass are used in preparing the framed certificate. The total price of $139.95 includes the WorldCom, Inc. certificate, frame, labor and heavy duty packaging and USPS priority insured mailing in the continental United States. Mailing to Alaska, Hawaii, and international destinations are available at actual cost.